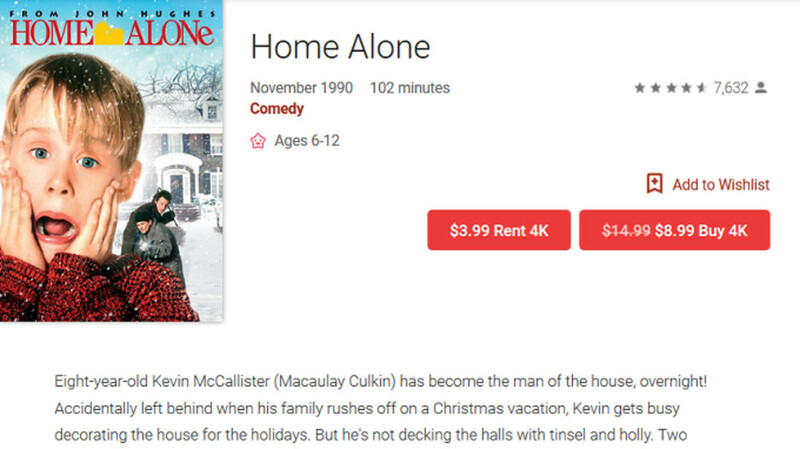 Who wouldn't love to celebrate the holidays by watching a young Macaulay Culkin chase out Daniel Stern and Joe Pesci while the pair are trying to rob his family's house in Home Alone? The 1990 comedy, normally $14.99, is available for just $8.99 from Google Play Movies & TV during its holiday sale. With the discounts, holiday classics are available from $4.99 and up. For example, at that price you can purchase Tyler Perry's a Madea Christmas. Some movies have been cut in price by more than 50%, such as Jingle All The Way. This delightful comedy, starring Arnold Schwarzenegger and the late Phil Hartman, can be purchased for $6.99. Tim Burton's stop-action holiday fantasy, The Nightmare Before Christmas, is on sale for $12.99. And don't forget that holiday must-see Die Hard. For some reason, the Bruce Willis action film is listed among the other holiday flicks, priced at $7.99. Also priced at $4.99 is the Director's cut of Bad Santa, down from $11.99, Love The Coopers (normally $14.99), Christmas Cottage (usually $17.99) and Angels Sing (reduced from $11.99). The highest priced films at $14.99 include several animated pictures from Disney such as Mickey's Christmas Carol and a Beauty and the Beast Christmas special. With these films on sale now, this might be a very good time for you to add to your digital movie collection.